Engine DescriptionThe Cessna Citation Mustang is powered by 2 Pratt & Whitney Canada PW615F-A engines mounted on the on each side on the rear of the Citation Mustang. The Cessna Citation Mustang Engine is built by Pratt & Whitney Canada through the PW600 series program. Pratt & Whitney Canada builds the PW615F-A engine exclusively for the Citation Mustang very light jet. 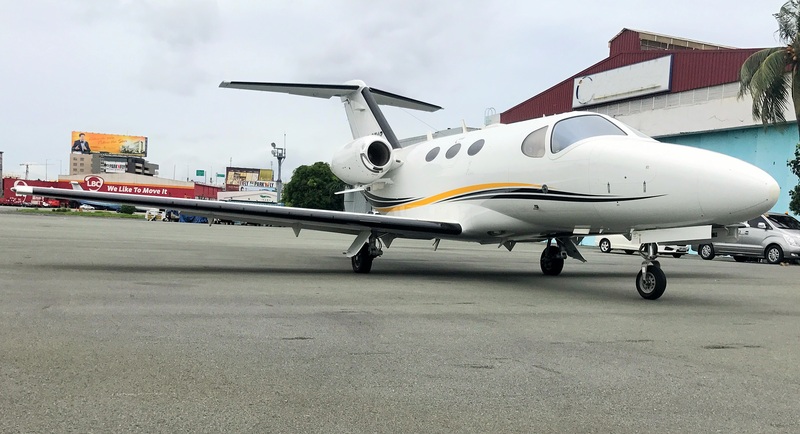 The Cessna Citation Mustang Engine - PW615F-A has a 2.8 to 1 bypass ratio and a counter-rotating twin-spool design with 3 compression stages and 2 turbine stages. 1,460 pounds of thrust is provided by each of the PW615F-A engines at sea level. Pratt & Whitney Canada's PW615F-A engine is controlled by 2, dual channel full authority digital engine controls (FADEC) that is found in the tailcone of the Citation Mustang. To help provide the right amount of trust at certain parts of a flight, the Cessna Citation Mustang engine thrust levers have detents that allow pilots to easily adjust thrust to match the best choice for the phase of flight (Takeoff, Climb, Cruise, Idle). The Cessna Citation Mustang Engines have wide-ranging engine diagnostic capabilities for maintenance personnel. The PW615F-A engine has a continuous loop fire detection system that monitors the engine area for a fire. Fire extinguishing in the PW615F-A (Citation Mustang Engine) is provided by a single-fire system using Halon.